Baypark might have been held on December 7 1986. Glad to see that one of my all-time touring car heroes Allan Grice won this title. To my reckoning he won few races during the Group A era and the SPTCC was his only title during this. Would the South Pacific Touring Car Championship be an equivalent of the 1960/1970s TASMAN single seater series, but for tin-tops? I'll have to get the tape out to check, but i'm pretty sure Rd1 of the 1986 South Pacific series was at Calder Park (doubled as Rd5 of the Australian Endurance Series), the event was run under the name "Sun South Pacific 300", and i recall the commentators at the AGP referring to the Group A race as Rd2 of the series. Not sure of what the SPTCC was all about.... the same name was used in the early 1970s for the Production Touring Car races that supported the Australian rounds of the Tasman Series. An SPTCC was also run in 1987 (Adelaide was Rd1 that year), and of course the Asia-Pacific TCC was run in 1988. I've also seen reference to the "1987 International Touring Car Championship", which was supposed to incorporate Bathurst, Calder, Wellington, Pukekohe & Macau from late 1987.. but that is for another thread of course. This is obviously an Australian production, but what was the New Zealand TV-situation at the time - chances of other races covered? Local TV covered all the Wellington Street Races in full. TVNZ covered the races from 1985 to 1989. The 1990-1993 and 1996 races were covered by the new TV3 network. The Australian Channel 7 commentary team came over to join the local crew from 1986 to 1987 WTCC race - and the highlights shown on youtube are what were shown to the Australian TV audiences. Pretty sure the race was only live in NZ and Aust TV got these 40 minute highlights packages. The full Australian commentary was probably added to the highlights packages, as I'm pretty sure that TVNZ used both NZ and Australian commentators. I used to have the 1988-93 races on tape. Not sure how many I taped over and they are in storage in NZ now. Not sure if the tape is any good anyway. One thing that is interesting about the coverage of the early Wellington street races is that there are no in-car cameras used. I believe they tried with an in car camera with Brock car in the 1987 Jan race, but the tall buildings interfered with the signal. I believe it may have been the 1988 race before in-car camera technology was good enough - as there is in-car camera footage from inside the Johnson Sierra available on Youtube. There was a South Pacific Touring Car series in the early 1970s for Australian series production cars during the Falcon GTHO/Torana XU1 era. But these races were held in Australia. I believe they were held during the summer as support races to the Tasman series. As far as I remember, the 1986 South Pacific Touring Car Championship was an attempt by the NZ track organisers to cash in on the popularity of Group A at that time in NZ and to try and link up with a few Australian races to provide an international championship. I think the hope was that Australian teams would run the first few rounds in Australia and then bring their cars over to NZ for the final few rounds and then stay on for the Nissan Mobil series in January 1987. Of course, only Allan Grice and Charlie O'Brien ended up doing the full series - and Grice drove both a Commodore and a Skyline. 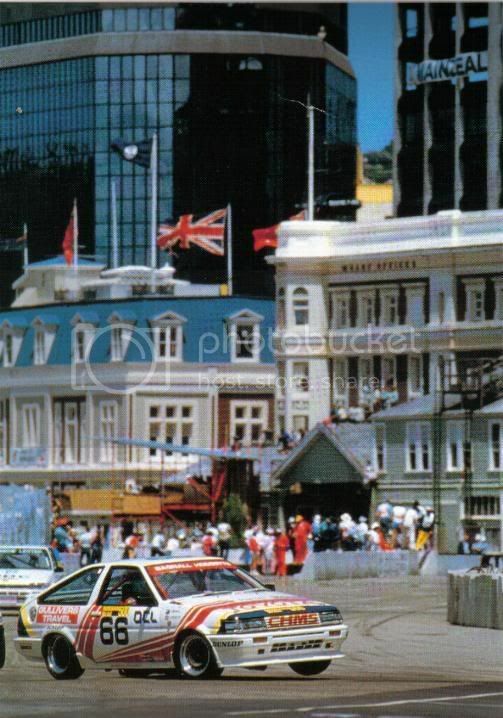 The NZ rounds of the 1986 South Pacific series also replaced the New Zealand Touring Car Championship, which is how Charlie O'Brien & Glen McIntyre - who scored the most points in the three NZ races - ended up as 1986 NZ Touring Car Champions. Whereas Grice won the South Pacific Touring Car Championship by scoring points in all rounds. This series and the early 1987 Nissan Mobil 500 signalled the height of popularity of Group A in NZ. I think the Simpson series was going to be held again in late 1987, but was cancelled due to a lack of interest from the teams. For the 1987/88 season (for another thread), there were fewer races, with the WTCC round at Wellington, the Benson & Hedges 500 at Pukekohe a week after Wellington and a return to sprint races for the NZ Touring Car Championship during the NZ summer series over 87/88. Group A simply became too expensive with the arrival of the Sierra Cosworth and BMW M3 - and few NZ teams could afford either. As a result, from 1987 until the death of Group A in 1992, the fields were smaller, although there was still some good racing. I do have extensive material covering the NZ scene from 1987-92 in storage in NZ. It may take some months, but eventually I'll get all of the magazines and reports together and put up the full results on ten-tenths. Thats pretty much on the money. Evan Green commentated on the 1986 race for NZ TV, but Neil Crompton was over there doing interviews 7, and he and Mike Raymond voiced over the highlights for Australian audiences, using the NZ footage. For 1987 January, Mike Raymond & Neil Crompton were part of the NZ live commentary, and then voiced over highlights later for Channel 7 in Australia. Unless we did it in another thread, we seem to have stopped short of looking at the two Nissan-Mobil races at Wellington and Pukekohe- though Jesper linked some Youtube video a page or so back, and there have been a few mentions through the thread. Results are on Frank de Jong's site, but incomplete- particularly for Pukekohe. Found a few pics on 'The Roaring Season' forum and dug out the 1987 Bathurst annual to get an idea of the entry. To kick off with TWR, two cars appeared at Wellington (Walkinshaw/Percy and Hahne/Hulme) sponsored by Strathmore Group- neither finished at Wellington, and just a single car for Hahne/Percy at Pukekohe- IIRC one car was shunted at Wellington? Last edited by KA; 17 Sep 2011 at 12:48. I think you're right about the second XJS was a non-starter at Pukekohe because of accident damage. I seem to remember that the TWR Jaguars were running 1984 spec tyres because no development had happened. Any confirmation of this? The video you posted a link to certainly mentioned tyre problems a couple of times, and the Hahne car certainly looked pretty lurid and sideways at one point. There's also a brief pitlane interview with TW in which he says their tactic had been to sit back early in the race, however, unscheduled pitstops for three punctures had messed the plan up- again does this hint at tyre troubles? Walkinshaw had to go home straight after Wellington (i'll have to check the books, but i think there was a family issue of some sort). At the same time David Parsons had earned Larry Perkins wrath after crashing the Enzed Commodore while in a very strong position at Wellington, and Perkins wasn't keen on the relationship continuing. Hulme did a deal with Perkins to partner him in the #11 Commodore at Pukekohe, while Hahne moved across to the sole #51 XJS and Tom went home. It was a wierd finish this one. The two Dealer Team cars went around in formation for the last two or so laps. Charlie O'Brien caught up to them, but seemed to think the race was over or something as he just cruised around behind them, rather than try and overtake. Fury/Seton had this one in the bag by half distance, they were getting on to a minute infront when they came in for their scheduled stop, and the car didn't go any further. This car was #4 and sponsored by U-Bix Copiers.... what was the origins of this car? Was it the same car as the one that came 3rd in the 1986 Wellington 500, #4 again, sponsored by "Rock-Gas" and driven by Andersson and Dave McMillan? Last edited by racer69; 19 Sep 2011 at 12:53. Yes, the bit about Walkinshaw returning to the UK after Wellington rings a bell with me as well. I had it in my head that it was a business commitment back home, but thinking about it, your suggestion makes more sense- if Tom had always been going to miss Pukekohe because of an existing business commitment, they'd have had another driver lined up to take that seat. Re: the Volvo, given Andersson's presence at both races, it was almost certainly a car from Europe. Possibly the Soderqvist team? My memory is that Walkinshaw's father was very ill and he had to get back to the UK for that reason. Visit Frank de Jong's homepage! I have a copy of the Adelaide F1GP programme and above the entry list for the Group A support race it states that it is the 'South Pacific Touring Car Championship Round 2'. 25/01/87 Wellington Nissan Mobil 500. 1/02/87 Pukekohe Nissan Mobil 500. I have programmes and some newspaper clippings for all the above except for the Calder SPTCC and Bay Park B&H so if you need more info, I'll see what I have. I've already looked for the 1/02/87 Pukekohe Nissan Mobil 500 results without any luck, sorry. Thank you for the overview, Malcolm. It clarifies a lot. I have just found a top-10 and bits from the Pukekohe race on 1st February 1987. I'll just have to make some sence of it and will post what I've got. Entry lists for the various races will be very interesting, if you could scan them or produce them otherwise.